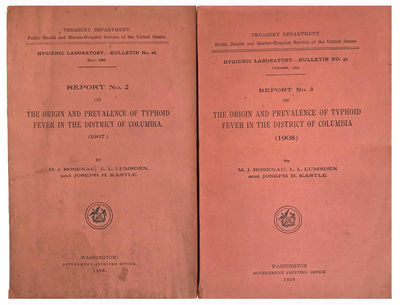 On the Origin and Prevalence of Typhoid Fever in the District of Columbia (1907) [+ (1908)]. [2 volumes]. by ROSENAU, Milton Joseph (1869-1946); Leslie Leon LUMSDEN (1875-1946); Joseph Hoeing KASTLE (1864-1916).